Even after many years in the mid-valley, it’s possible to discover nearby destinations in the countryside that are off the beaten path but not all that remote. Here’s one such place, which I found the other day. It’s the Baker Tract of the E.E. Wilson Wildlife Area. On Buena Vista Road in southern Polk County, it’s about two miles due northeast of the 1,788-acre main part of the wildlife area. 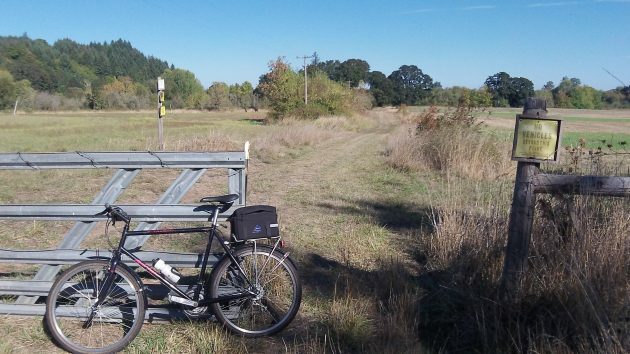 There’s an unimproved and kind of bumpy track into the 55-acre Baker property, which the Oregon Department of Fish and Wildlife acquired in a land swap in 2002. When I rattled into the place on my old mountain bike the other afternoon, the sun was shining, there was a light breeze, and nobody else was around to disturb the solitude of the open countryside. Signs at the gate, though, say the area is available for hunting and wandering around. Passing by there before, I’d always thought it was part of the Luckiamute State Natural Area to its south, managed by the State Parks Department. When I finally stopped to take a look, notices posted at the gate told me otherwise. The entrance to the Baker Tract, off Buena Vista Road. I have oft had the pleasure of having wandered into these same places whilst in the company of my two fine hounds. As Mr. Hering put it so well, ODFW and State Parks are doing quite well, thank you. The areas around Buena Vista maintain the sense of small farms that were probably the norm for the Willamette Valley before the advent of high mechanization. Stunningly beautiful and a more human scale. Hasso, ever take the ferry across at Buena Vista and make the loop? Mr. Hering, you must get off your bike and bury yourself in election coverage and City Hall Machinations. You’re going soft. Amen, Please cover the candidates.